Thoughts of a Young(ish) Car Guy - Brett Morgan: Nicki Minaj's Aventador is from Lamborghini Sarasota? 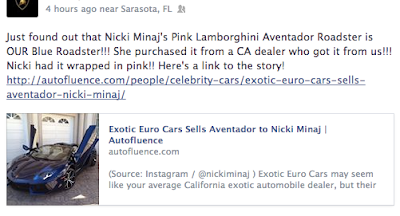 Nicki Minaj's Aventador is from Lamborghini Sarasota? Minaj's Lambo; Should we tweet her and let her know her car's origins? So here is how the story goes. Nicki Minaj is driving a Lamborghini Aventador from Lamborghini Sarasota, one of our Morgan Auto Group dealerships just south of Tampa. That's right. Now how could that happen? Well first of all I am sure she had a handler pick up the car for her --- but that's not the reason she doesn't know it's from us. We recently sold a Blue Roadster to a regional Florida "agency" representing an area "Sports Star." We found out sometime later the car was on the showroom of a well known California re-seller of used exotics. Lamborghini is pretty particular about who they let sell new Lambo's after all so upon hearing this news they were less than thrilled. As a dealer I can't say I'm all that excited that essentially we were lied to by a domestic agent but I guess stuff happens. I also have to say there is a small chance that "Exotic Euro Cars" just did the custom work and didn't really sell her the car --- but they are saying they did...and frankly it would fit their business model to do so. So who made the play here? Not sure if we ever know though I may have some homework to do tomorrow. Thanks for sharing these updates. Looking for the luxurious car rental services exotic car rental edmonton offers the variety of car rental services. Get the cheap lamborghini rental los angeles from Black & White Car Rental who offers the luxurious car on rental services at the reasonable price.